Heyo, everyone! LionWing president Bradly Halestorm here, and today we bring to you a look at one of Sainome Colosseum R's ten playable characters, the Gentle Priestess/God Slayer. We'll be taking an in-depth look at the character's lore and gameplay while exploring both her Normal Form and Awakened Form. So without any further ado, let's get to it! This blurb paints an ominous backstory for the priestess, to say the least. While in her Normal Form she is a kind, innocent sister of the Church, when awakened, she becomes the very thing her organization fights against: a god-slaying zealot hellbent on destroying all that would oppose her. 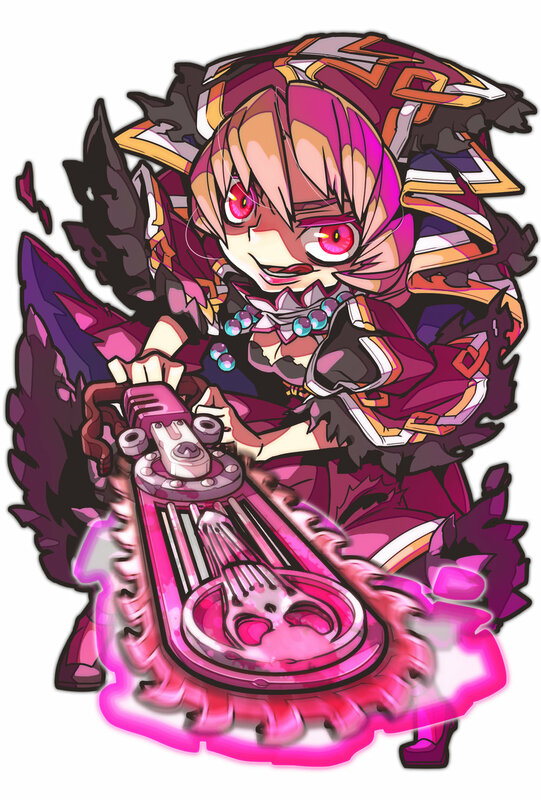 This underlying persona of hers is both dark and crazed, made all the more evident by the weapon she wields in her Awakened Form: a hellish chainsaw that’s black and pink in color and emblazoned with a skull on the end of its guide bar. What can we say, she severs your limbs in style. That said, it’s never made perfectly clear what the Gentle Priestess/God Slayer aims to accomplish by entering a fighting tournament where the ultimate prize is simply money and fame. What we can confidently say, however, is that ever since showing up in the kingdom’s capital city, there have been a series of mysterious murders—murders that have stirred the rumor mill into concluding that the kind-looking priestess is actually the culprit. Thus, it may not be far-fetched to think that the priestess is, at least in part, using the sanctioned tournament as a forum to uncuff her murderous desires. To this end, it would also be logical to assume that the priestess does her best to keep the God Slayer within her in check the best she can but loses control from time to time, which perhaps is what’s resulted in the aforementioned killing rampage. Suffice it to say, there’s more than what meets the eye with the Gentle Priestess. Now let's discuss the character's playstyle by starting with her Normal Form abilities first. The character's Normal Form, the Gentle Priestess, is all about either mitigating damage or provoking an attack to intentionally take damage. 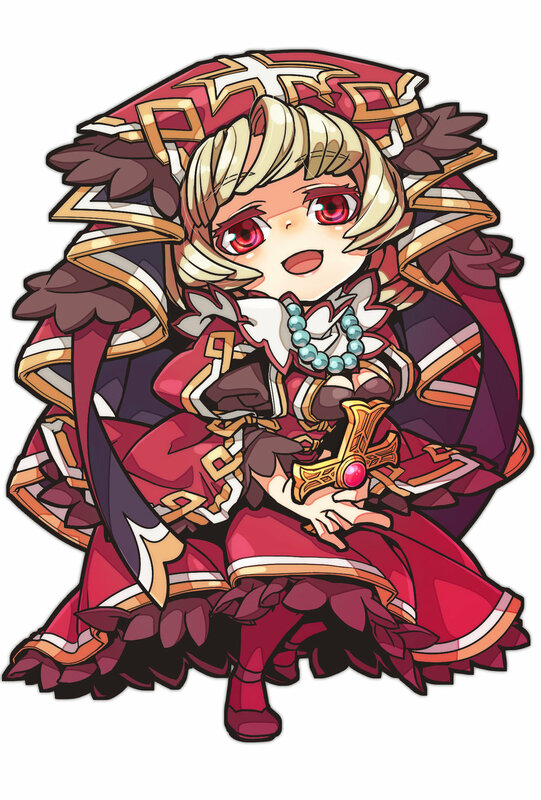 Looking at her first ability, “Doctrine of Disarmament,” the priestess is able to reduce the damage she takes by 1 for every discarded Sainome Card she currently has equipped, up to 4 damage. (If you missed the Swordsman/Demon Warrior entries, Sainome Cards comprise the game's equippable weapons, items, magics, and skills, sometimes referred to as equipment or gear.) Because there are four equipment slots, the priestess can technically discard every piece of gear she has equipped, effectively mitigating 4 damage from her opponent. This is a monster skill when used in that all-in way, but the skill is actually best used when players are not blowing through all four pieces of gear they have equipped. Because of her second ability, which we'll be going over in just a moment, it's best to use Doctrine of Disarmament when you're trying to stall for time in order to draw the card/s you want. Doctrine, then, can be a great way to slowly strip the opponent of their big plays while waiting for just the right time to awaken. Which brings us to the Gentle Priestess's second ability, “True Nature.” True Nature states that when the priestess takes damage, she transforms into her Awakened Form. Yup, that's right. A single hit could send her into beast mode. This awakening ability is in stark contrast to the Pure-Hearted Swordsman's awakening “Heritage” ability that requires him to be at 3 HP to finally awaken. True Nature is the complete opposite of that; instead of awakening when she's nearly defeated, she awakens almost right away. If Doctrine of Disarmament is completely forgone by the player, the Gentle Priestess's playstyle is super fast and aggressive thanks to triggering her Awakened Form super quickly. Once awakened, the priestess transforms into the killing machine known as the God Slayer. The God Slayer has some of the best abilities in the entire game. Let's look at them. First up is "One-Shot Massacre." Yes, it's just as destructive as its name implies. One-Shot Massacre allows the God Slayer to triple the damage of any Saw or Chainsaw attached to one of her equipment slots. To illustrate how this can literally win the game in one attack, allow me to point you to the default damage of the Saw and Chainsaw Sainome Cards. Saw does 2 damage by itself, without any modifications. Chainsaw is double that: it does 4 damage on its own. So, with One-Shot Massacre, Saw could do 6 damage while Chainsaw would do 12. 12. Damage. If you're using the standard (tournament) rules, you only start with 10 HP! So Chainsaw doing 12, via One-Shot Massacre, is just insane. Onto the second ability, “Unholy Constraint.” This skill states that if you have two or more open equipment slots, your opponent cannot use counterattack cards. The savvy player will work hard to rarely have more than one Sainome Card equipped when in the God Slayer Form. After all, the God Slayer is best activated when you have Saw or Chainsaw in your hand while you're in the Gentle Priestess Form. The God Slayer's last ability is the one that balances her out. One can only stay in the God Slayer Form until your Discard Phase. Thus, “Feigned Innocence,” the Slayer's third and final ability, states that players must return to Normal Form at the end of their Discard Phase. So, again, you should plan your strategy around awakening the God Slayer when you can maximize her damage output via One-Shot Massacre. Naturally, there will be times that you will be attacked in Normal Form and won't be able to make use of Doctrine of Disarmament to mitigate the damage, thus awakening the God Slayer at a time when you aren't holding Saw or Chainsaw in your hand. But on balance, God Slayer Form is best used when you are holding one of those two cards. The Gentle Priestess/God Slayer is super powerful but a bit tricky to play, because everything is dependent on what cards you draw and how you're mitigating damage or letting it through intentionally so as to awaken. This is not a newbie-friendly character. It requires a good amount of forethought and an actual gameplan and is best avoided by those who just want to play on autopilot. But, in the right hands, the Gentle Priestess/God Slayer is nigh unstoppable. The best strategy when playing against someone who's fielded her is using cards that limit what she can equip and making sure to avoid small attacks. One of the best approaches is hitting hard. This way, you're forcing her to discard all attached cards, taking away her attack potential, or you're putting up big numbers, which offsets the cost of her awakening when taking damage. The last thing you want to do is hit her for 1 HP so that she awakens the God Slayer and then she hits you with One-Shot Massacre. And that'll wrap up this entry in our Character Spotlight series! Be sure to check back next Thursday when we drop another mega-sized blog chronicling the lore and gameplay of our next character! Like last time, if you have any questions or comments for us about the characters as we go along, don't hesitate to hit us up on Twitter, Instagram, Facebook, or in the comments section below.